Since the onset of the Civil Rights Movement, the Episcopal Church has by voice then transferred to paper, made commitments to dismantle the sin and evil of racism. Pockets of success have been achieved when diocesan bishops have made this a priority. Unfortunately, the denomination as a whole has made little progress. Come follow the trail and discover how often commitments have been made and where the energy has gone instead. Find out how long completing a dismantling racism workshop has been required of members of committees of the church. New hope comes from our current presiding bishop, who has made this a priority. 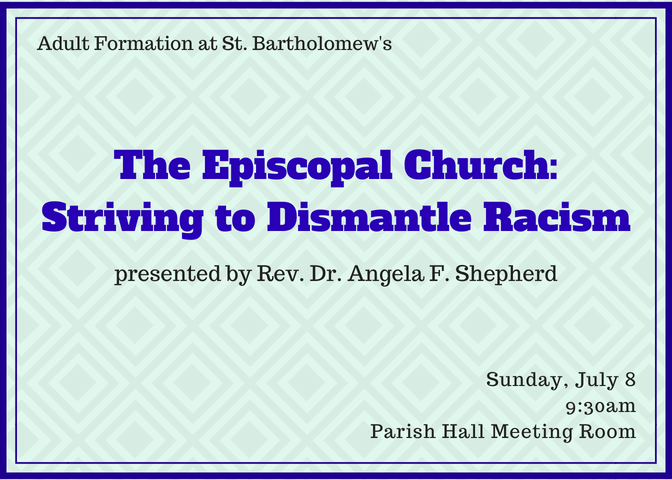 Led by our rector, Angela Shepherd+, who is a member of Executive Council Committee on Antiracism, former facilitator of dismantling racism workshops, presenter, and trainer of facilitators. Breakfast will available in the Parish Hall starting at 9am for a small fee. Class begins at 9:30am in the Meeting Room in the Parish Hall. For more information, go to stbartsatlanta.org.